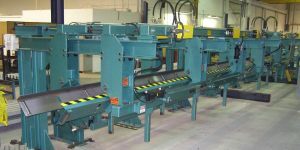 Often times the bottleneck for roll forming lines is the process of removing product from the end of the line. This should be considered an opportunity to improve overall production efficiency with the use of a stacker. 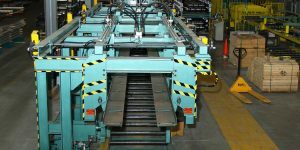 Stackers also eliminate the ergonomic and safety issues created with manual sheet handling. 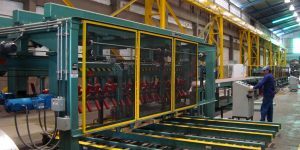 A properly designed stacker will allow components to be moved from the end of the production line onto a well-organized pack where operators can focus on labelling, packaging and loading trucks. 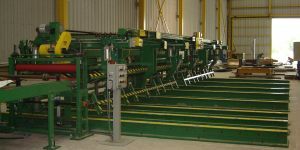 Metform offers standard panel and deck stackers, as well as, custom designed units for specific customer applications on both new and existing lines. 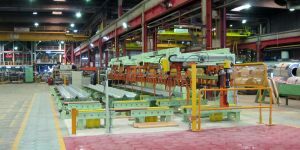 Metform also produces stackers for coil processing lines, again, for both new and existing lines. 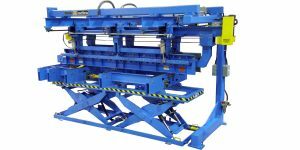 As the name implies this stacker was specifically designed to move sheets from the line and stack them directly on the truck. 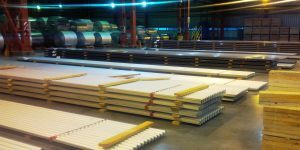 There has never been a better example of “one piece flow” for lean manufacturing. 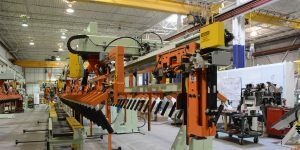 Scrap is removed in-line without production disruption.The stacker has a shuttling head which automatically builds up two packs per truck in an alternating progression so as not to cause the truck to lean from “one sided” stacking. The labor savings and throughput improvements are significant making the return on investment for this equipment elementary. 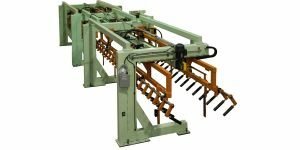 Improve your throughput and pack handling with a Metform stacker in your line.